I am not somebody who makes endo/beginning of year predictions, and I am not about to stsrt now. But I have just read a guest post by Jeffrey Frankel on Econbrowser where he brags about making six accurate predictions for 2018 while not reporting on some others he made that did not work out so well. I happened to largely agree with them when I saw him making them, with some questions on two, while myself quitely making some that failed to come true. I shall comment. Frankel's six predictions were: 1) market volatility would increase (presumably across many markets), one I expected and that clearly has come true; 2) the stock market would fall, which I had mixed feelings on, thinking that indeed the bull market of 2017 was over but given my expectation of high volartilty unsure how it would end and indeed the markets did hit new all time highs a few months ago, only to plunge more recently to end the year lower. 3) that Trump would switch from criticizing the Fed for not raising interest rates fast enough to for it raising them too fast, with my only caveat there being that I think he was already in 2017 makking noises about wanting the Fed not to raise interest rates too fast; 4) that minerals prices would fall, with my view on this being basically the same as my view on the stock markets, expecting greater volatility without being sure of where they would be at this point and with them indeed not too long ago being well above starting year levels if now lower; 5) tax cuts wouls raise deficits, for sure, and 6) those deficits would raise both the dollar and the current account deficit, darned tooting. So where did things not go as I expected, or to be more precise, where I hoped, having fears that what happened might well happen? The most important was his decision to withdraw from the JCPOA, the Iran nuclea deal. I feared that he might ddo that, but as of a year ago he had continued to verify that Iran was obeying the agreement, and most importantly he has in place a trio of advisers supporting sticking with the agreement, notable SeeState Tillerson, NatSec Adviser McMaster, and SecDef Mattis. As it was, he removed those first two not too long before he withdrew from the agreement, replacing them with Iran hawks, Pompeo at State and Bolton as Nat Sec adviser, with Mattis clearly sidelined and now out as of tomorrow, with this decision a facto in his resignation. What has surprised me more than that Trump made this withdrawal, which I certainly viewed as a serious possibility, has been that his reimposition of economic sanctions has had as big of an impact as it has. Aside from the rump of Israel, KSA, Bahrain, UAE, Egypt, and one or two other minor powers, no other narion has supported Trump's withdrawal from the agreement, in particular none of the other signatories to the agreement: UK, France, Germany, EU, Russia, and China, with the UNSC also a party to it. But despite this near-solid political opposition, many private corporations, especially those based in Europe, have repsonded to the threat of not having access to US markets and have withdrawn from doing business with Iran, with France's Total a poster boy for this. Also, many nstions not part of the agreement have reduced, if not fully elminated, importing oil from Iran. I did not expect this level of obedience to Trump's reimposition of economic sanctions, given all that political lack of agreement, but indeed he has gotten away with it and may yet convince the SWIFT system to cut off Iran. The impact on the already not too-well-performing Iranian economy has by all reports been pretty substantial. That said, Iran has responded by making no changes in policies. Some of this is good, most importantly continuing to adhere to the JCPOA with the strong political, if not economic, support of the other signatories (some, especially Russia and to a lesser degree China, have not cut back economic support or have even increased it some). OTOH, Iran has continued to engage in missile tests and some other activities that are not supported by other nations and which do not particularly add to peace in the region, although I understand that their obvious response is not to cave at all too demands being made by Trump. Indeed, again, I am glad they have not responded by themselves withdrawing from the agreement and restarting substantial uranium enrichment activities. I note as sort of an aside that I do not think despite their rhetoric that what has bothered the Israelis so much has been the threat of Iran getting nuclear weapons, which I think they know has been not likely to happen any time soon if at all. Rather their more immediate concern has been trying to keep Hezbollah weak, whom they were unable to fully defeat in 2006. So they see the economic sanctions as helping them by making it harder for Iran to arm Hezbollah, although I gather that Iran has not particularly altered its activity on that front. Something else that has surpised me somewhat has been how little Trump has suffered politically for this move in the US. Indeed, if anything it seems to have been a hit, with him getting praised for having "fulfilled a campaign promise," even if this has led to widespread condemnation and ridicule around the world. But I guess this shows how isolated the US public is from the rest of the world, especially thos in the Fox News/Trump news bubble. Some of his other bad decisions seem to have been similarly motivated: to satisfy unwise campaign promises. I kind of suspect a motive for this is all the reporting about his constant lying. Maybe he lies 15 times per day, but, wow, look at him keep this campagin promises! The other area where I feel I have not made good predictions, although in fact I made none and I think I accurately understood that it was unwise to make any given the unpredictability of Trump, has been with regard to his trade wars. Really, I am not sure what I expected, but I know that I thought that if he actually would come to an agreement with Canada and Mexico on a new NAFTA, which I did not expect, I did not expect that it would involve him keeping in place the steel and aluminum tariffs against them with them going along with that. Of course, it may well be that his NAFTA 2.0 may fail to get ratified by the incoming Congress, but I did not expect this. I suspect that his adherence to those tariffs really is tied to his obsession with helping the coal industry as well as more generally the industrial Midwest, even as the steel tariffs have hurt the Midwest auto industry. But metallurgical coal output and employment is up, even if electric power demand for coal has continues to decline. This is probably the political motive behind this particulae outcome. But, again, I really do not know what he is up to with trade or where he is going, esepcially given that he clearly believes strongly in a lot of rank nonsense such as that bilateral trade balances indicate one nation winning at the expense od the other. In the meantime, Happy Gegorian New Year to one and all. 2. It is certainly true that serious action against climate change will require giving decarbonization needs the highest priority. In that sense, economic growth as an objective will have to recede. This doesn’t mean growth is “bad” in any general sense, just that it now needs to rank lower among the many things we want for ourselves. Given any level of decarbonization (and setting aside all the other competing needs, of which there are many), if we can achieve this with more growth, or less degrowth, so much the better. The one point of agreement I have with the degrowth view is that the argument sometimes put forward that we can’t afford to take stringent measures against carbon because it will derail economic growth has to be rejected. 3. Grubb is right in his critique of Schröder/Storm insofar as there has yet been no determined action to forestall catastrophic climate change. Extrapolating from the weak, hesitant policies of the past tells us little about what is likely to happen when policy gets serious. We will be entering unexplored ground. 4. Standard economic models embody this extrapolation approach by applying consumption functions derived from past experience to the various goods and services that have carbon inputs. A carbon price or some regulatory constraint is introduced, and the model is run to see how desired consumption changes. (These models typically assume constant levels of employment and capital utilization.) Given this structure, there is little they can tell us about the consequences of rapid, massive price changes that make the prior structure of demand unaffordable. A carbon price of hundreds of dollars per metric ton, which is where we will need to get to within a few years of instituting a policy, is essentially a demand-forcing mechanism in the same sense that some past regulations have been technology-forcing. It imposes a reduction in demand beyond the range of substitution people have historically faced. It’s brutal, but that’s what it will take to live within a carbon budget compatible with 2ºC of global warming, much less 1.5º. 5. The only conceivable way to sell such a policy, and to sustain living standards in the face of such a shock, is to return most or all of the carbon revenues to the public in a progressive fashion, since ability to cope with the shock is roughly proportional to one’s income. A per capita rebate does this efficiently, fairly and transparently. 6. The main threat to the level of economic activity is the massive capital writeoff that such a carbon policy shock would entail. Current speculation centers on the stranded assets of fossil fuel suppliers, and this is substantial, but I estimate it constitutes no more, and probably much less, than half the capital loss faced by investors. There are entire industries whose existing stock of investment will be rendered uneconomic by a serious carbon price; think of the airlines, for instance, and the businesses like tourism that depend on affordable air travel. Think of the trucking fleet, the current location of residential and commercial real estate, or industrial agriculture with its large fossil fuel inputs. Existing models consider changes in operating costs; what none of them take into account is how much of the capital stock will simply have to be scrapped, and what the economic consequences will be. Here it is precisely labor and capital utilization that is in question. Based on historical analogies (discussed in the book), I believe it is likely that stringent carbon policy will be accompanied by a large negative economic shock, greater than any recent demand-driven recession, including 2008. Keynesian policy can help us get through such an episode but can’t avoid it. 7. And this means degrowth, at least for a while. But it’s not planned or desired degrowth—on the contrary. It is the result of having the wrong capital stock for the decarbonized economy of the future; we will have to submit to a contraction, but we should anticipate and counteract it to the extent we can. Above all, we should adopt policies to protect and improve living standards in the lower income countries. I predict this will be a tough sell when belts are tightening throughout the capitalist world, but if you care about social justice this will be your fight. Outgoing Chair of the House Judiciary Committee, Bob Goodlatte is my Congressman. I even know him, having had civil almost friendly relations. He has been in office for 26 years. But his career exemplifies the degeneration of the Republican Party from a Lincoln-derived progressive force in US politics to the racist and reactionary disaster that it has become with Donald Trump as president. The quick story on this is that he was once an aide to a predecessor, M. Caldwell Butler, a "Mountain Valley Republican" who voted to impeach Richard Nixon as a member of the House Judiciary Committee back in 1974, the committee that Goodlatte has come to chair. In contrast to his former boss, Goodlatte, who entered office as a supposed "moderate," if not a full-blown Lincoln-derived Mountain Valley Republican, he has suppressed investigations of Trump and done much worse. While he has supported a long list of corporate special interests, probably the ultimate sign of how low he and his party have fallen is his final act as Judiciary Committee Chair, reported in today's Washington Post. He single handedly blocked a bill that was unanimously passed by the Senate to protect Native American women from violent attacks. His reason fo this was totally aobscure and ridiculous, a trivial concern that the bill favored certain agencies over others in making complaints about such violence. The bill was originated by outgoing Dem Sen. Heidi Heitkamp of ND, but apparently it will be reintroduced by Lisa Murkowski of AK next year, and hopefully it will pass. Indeed, I really do not know why Goodlatte is going out on this. What makes this all the more appalling is that our Congressional district contains the largest Native Indian tribe in Virginia, the Monocans, who have had a long history of being ignored and discriminated against. For those who do not know the fuller history here, the Shenandoah Valley has long been the base of the Republican Party in Virginia, with few slaves held west of the Blue Ridge. So this really does date back to Abraham Lincoln and the anti-slavery progressive Republican Party, with their descendants becoming these now nearly extinct "Mountain Valley Republicans" who were known for being reasonably liberal. There are still a handful of these folks in the state legislature, even as the Valley has largely gone hardline conservstive. The journey of Goodlatte folows this, going from the "moderation" of his former boss, Caldwell, and even his early years in the House, to his shameful final performance, leading silly hearings that had James Comey testifying in secret overt his objection, and then this final insult, this blocking of helping out vicitmized Native American women, almost a caricature of the Trumpist Republican Party. Abraham Lincoln, whose father was born in Goodlatte's district a few miles north of where I live, would be utterly ashamed of this conduct. Of course, it never happened this way. Instead we have a private octopus of an online shopping site called Amazon and a hobbled, money-losing public postal service that’s prohibited from even thinking about entering a new market—but provides crucial, subsidized logistics for its Amazonian overlord. That’s the world of today. But tomorrow? Why not think about acquiring Amazon as a public utility, or even setting up a public competitor to it? Where’s the road that takes from where we are now to the alternative universe we’d rather be in? Trump Brags To Troops About A Fictional Giant Pay Raise He Got Them - The president told military personnel in Iraq that they’ll get a raise of over 10 percent, their first in a decade. But it’s 2.6 percent, and they get a hike every year. Annual military pay raises are linked to the increase in private sector wages, as measured by the Employment Cost Index (ECI). In the 1990's, the annual military pay raise was capped at one-half percent below private-sector growth unless specifically granted a larger increase by Congress. The FY2000 National Defense Authorization Act directed that pay raises for 2000 through 2006 would automatically be one-half percent above the private-sector wage increases. Pay raises beginning in 2007 are equal to the increase in the ECI. Pay raises may exceed these automatic levels if authorized and funded by Congress. Trump got the troops nothing – the 2.6% nominal increase for 2019 was automatic and will capture the nominal increase in ECI. For all this talk of nominal increases year by year, one would think our troops would realize that a nominal increase in ECI that barely keeps pace with the rise in the consumer price index does not represent an increase in real compensation. The point of our graph is to look at real compensation changes from 2006 to 2018 using the percentage increases stated in our link as compared to what has happened to the CPI from 2006 (base year = 1) through today. Note for some years real compensation did rise but for other years real compensation fell. I assumed that a soldier received $30,000 in 2006 and with these nominal increases, his nominal pay had risen to $38,779 by 2018. 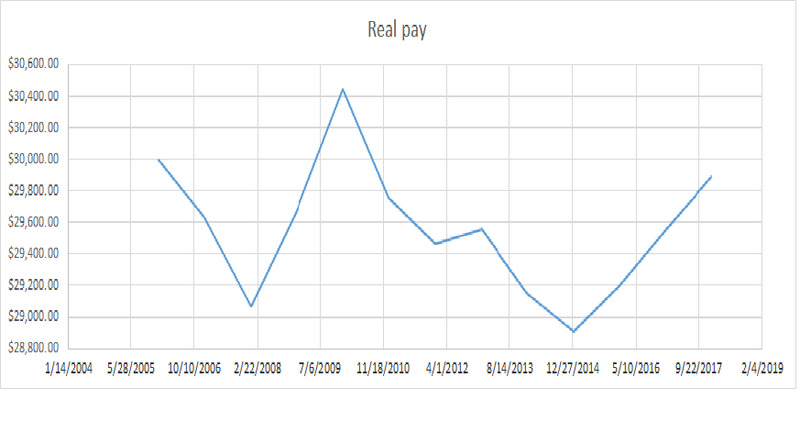 But with 2018 prices being 29.75% higher than they were in 2006, his real pay on net has declined. We do not know what inflation will be for 2019 but we should not be surprised if it turns out to be around 2.5%, which would mean real compensation will not grow appreciably. Our troops get that even if their Commander in Chief does not. And then there was Hurricane Sandy. Think about all those upper middle-class or wealthier white folks who lost all their possessions when the storm washed away their oceanfront properties. This is more evidence, that climate change is mainly about white people, right? People whose big picture window living rooms look right into the maw of sea level rise. Yesterday President Trump announced that he was removing all US troops from Syria over the next 30 days. Today, "Mad Dog" Jim Mattis, the US Secretary of Defense and widely viewed as "the last adult in the room" among the Trump national security team, announced his resignation effective at the end of February. This is not a coincidence, although his letter makes it clear that he had been thinking about this serously for some time. In his letter the most fundamental issue seems to be his concern for proper relations with US allies, with Trump obviously treating nearly all of them badly. So a crucial sentence is the following. "While the US remains the indispensable nation in the free world, we cannot protect our interests without maintaining strong alliances and showing respect to those allies." "The Defeat-ISIS coalition of 74 nations is further proof." Now I have mixed feelings about various pieces of this. Many of those upset by this sudden and unexpected decision by Trump are focused on Iran and Russia and Assad in Syria: that Assad will remain in power with both Russia and Iran influential there. I agree Assad is a murderous dictatorial creep, but Russia (and before it the USSR) has had a naval base there in Tartus since 1971 that they are not remotely going to give up. The Iranians are less important,so the worry about them is mostly silly huysteria. And on Assad, those most likely to replace him were radical Sunnis allied with al-Qaeda, the group that attacked the US on 9-11. Where this gets bad involves indeed ISIS or ISIL or Daesh to give some of its other names. They really are a bad bunch, worse even than al Qaeda from whom they split. Trump says we can leave because they have been defeated, but they have not been defeated. They have been pushed out of all urban areas of any size they once controlled, but they continue to hold out in a final desert area on the Iraqi border in the desert, and for whatever reason nobody has been able to finally defeat them. I fear withdrawal of US troops at this point, likely to be followed by a Turkish invasion to push out the Kurdish forces allied to the US that defeated ISIS in their old capital of Raqqa, will allow the obviously still pretty strong ISIS to revive and retake some of their former territories. I suspect this is also a concern of Mad Dog Mattis. Anyway, aside from the Turks signing a $3 billion Patriot missile deal after Trump made this announcement, this decision seems to be completely incoherent. The US is against Iran, but Iran gains, not to mention Hezbollah? That Trump may be pleasing Putin, well, what do we expect? And as for the Kurds? Well, we have screwed them over many times. No wonder the Mad Dog is walking out. The position I would like to take digs beneath the opposition between structure and agency, the empirical economy and the conceptions people have of it. No doubt the rules and incentives that direct economic life are the product of choice, and therefore consciousness, just as consciousness is strongly influenced by the problems our economic circumstances throw at us and the possible solutions it affords. Shouldn’t there be a coevolutionary process down there somewhere that encompasses both of them? Identifying such processes is the task of historians, and as we know, understanding the present as history without the benefit of hindsight is an enormous challenge. In my preferred world, this would be the project of political economists, giant armies of them, adequately encouraged and funded. We would see a constant flow of books and articles on the matter, hashing out points of debate. The real world is quite different, alas. Here is a thought intended to provoke research in this area. How do we understand the timing of the neoliberal turn? In the English-speaking world it took hold a few years before or after 1980, a bit later elsewhere. What transpired to account for this? A standard narrative is that the Keynesian postwar order cracked up over the crisis of inflation during the mid-1970s. A conservative alternative that trusted markets more and government less was vindicated by events and established its intellectual dominance. After a lag of a few years, policy followed along. One can critique this on matters of detail: economic growth remained stronger during the 70s than it would be thereafter, anti-Keynesians did not have a superior understanding of economic developments, and no intellectual revolution was complete within the space of just a few years. But the deeper problem, it seems to me, is that this attributes vastly exaggerated agency to coteries of intellectuals. Do we really think that the elections of Reagan and Thatcher, for instance, were attributable to a shift in grad school syllabi in economics and related fields? I propose an alternative hypothesis. From the end of WWII to the collapse of the Bretton Woods monetary system, a large portion of capital was illiquid, its value tied to its existing use. The rich sought to diversify their portfolios, of course, but there were limits. Stock market transactions were beclouded by large information costs, and share ownership tended to be more stable and concentrated. Fortunes were rooted in specific firms and industries. In such a situation there were significant divisions within the capitalist class that attenuated its overall political clout. Industries divided according to policy preferences, and political parties, which were essentially interest group coalitions, attracted different segments of this class. (In the US the Republicans were just as much an interest group coalition as the Democrats, just different interests like small retail business, domestic mining, nonunion manufacturing, etc.) Public policy in this dispensation, whatever its ostensible justification, reflected sectoral influence. Of course, all understanding of the world is mediated by the way we think about it. The wealthy didn’t say to themselves, “Gee, my assets are taking a hit, so the government needs to change course.” They turned to dissident, conservative thinkers who explained the “failures” of the 70s as the result of too little concern for the engine of growth, which (of course) was understood to be private investment. Market-friendly policy would, it was said, reinvigorate investment and spur economic growth. Keynesianism was seen as having failed because it took investors for granted, taxing and regulating them and competing with them for finance; politicians needed to show respect. It’s understandable why capitalists would interpret their problems in this way. The other side of the coin was political influence over ideas. Intellectuals who advanced the positions we now call neoliberal were rewarded with research funding, jobs and influence over government policy. When the World Bank and the IMF were remade in the wake of the 1982 debt crisis, this influence was extended internationally. Lending conditionality reproduced in developing countries the same incentives that had shifted the intellectual environment in the core capitalist world. This hypothesis—and it’s important to be clear that’s what it is—also gives us an explanation for why the 2008 crisis, while it did provoke a lot of reconsideration by intellectuals—did not result in meaningful institutional or policy change: the underlying political economic factors were unaltered. And it implies that further intellectual work, necessary as it is, will not be enough to extricate us from the shackles of neoliberal political constraints. For that we need to contest the power that undergirds them. When economists write, they can decide among three possible voices to convey their message. The choice is crucial, because it affects how readers receive their work. The first voice might be called the textbook authority. Here, economists act as ambassadors for their profession. They faithfully present the wide range of views professional economists hold, acknowledging the pros and cons of each ... The second voice is that of the nuanced advocate. In this case, economists advance a point of view while recognizing the diversity of thought among reasonable people ... The third voice is that of the rah-rah partisan. Rah-rah partisans do not build their analysis on the foundation of professional consensus or serious studies from peer-reviewed journals. They deny that people who disagree with them may have some logical points and that there may be weaknesses in their own arguments. In their view, the world is simple, and the opposition is just wrong, wrong, wrong. Rah-rah partisans do not aim to persuade the undecided. They aim to rally the faithful. Liberal economists had a bit of a debate in 2016 over some rah rah economics on our side. Rather than revisit that mess, can I slightly object to this from Mankiw? The bottom line is that for a politician seeking election, opposing free trade is a lot easier than supporting it. Many voters are more likely to view foreign nations as threats to U.S. prosperity than as potential partners for mutually advantageous trade. Economists have a long way to go to persuade the body politic of some basic lessons from Econ 101. To be fair to Trump and other anti-globalization zealots, amid all their mis-information and bluster is a kernel of truth. The United States produces a lot of intellectual property, including movies, software, and pharmaceuticals. The failure of countries, especially China, to enforce the copyrights and patents that protect intellectual property constitutes a loss to the United States similar to outright theft. Pharmaceutical companies make a ton of profits off of their patents as it allows them to enforce extreme and costly monopoly privileges. If the Chinese government wants a more competitive drug market, perhaps we should emulate their policies not object to them. Wow. Sometime ago I here called for Crown Prince of the Kingdom of Saudi Arabia, Mohamed bib Salman bin Abdulaziz al Sa'ud, (MbS) to be rmoved from his position. How he is punished beyond that for his crimes, I do noit care, especially as I think being prevented from becoming the King of Saudi Arabia will be for him the worst punishment. So the for once the US Senate agrrees with me, 100%, really. Hey, I have to cheer such an event that has never happened brfore and probably will not again. Yay! The US Senate has 100% voted to declare that MbS is guilty for ordering the murder of Kamal Khashoggi. They are right. He is guilty guilty guuilty. He needs to be removed, and the sooner the broader Saudi royal family figures this out and moves to replace him, the better, really, for the world as a whole, given the ongoing important role that nation plays in the world economy worldwide. It is clear thart he came to power thanks to Jared Kushner and the Trump admin, who supported his coup removal of his predecessor, Muhammed bin Nayef bin Abdulaziz al Sa'ud, who was deeply respected by US mil-intel apparati. MbS had become Defense Sec and was able to send his guys to MbN's palace and imprison him until he gave up and let MbS replace him as Crown Prince. None of this woudl have happened without Trump and Jared Kushner approving of it, which they did. So now the US Senate has figured out that I was right that this was a totsl disaster, that MbS is completely unacceptable as a leader of Saudi Arabis. This is not a matter of the US declaring against a democraticallhy elected leader. This is ultimately an absolute monarchy now facing its deeply difficult succession problem. Folllowing corrupt influence from tehe US, their leaders have made a bad decision, choosing MbS. I appreciate that it may not be that easy for the royal famoly to get rid of this power hungry murderer, but I applaud this unanimous vote from the US Senate. He needs to go. BTW, some time ago there were rumors that a "Co-Prince" might be approved, although with MbS retaining the succession right. That Co-Prince is the current Governor of Mecca, a very serious position in that nation, Khalid bin Faisal bin Abdulaziz al Sa'ud, 78 years old. I actually know KbF and can attest that he is a deeply intelligent and reasonable person who would make an excellent replacement for the worthless and ddisgusting and degraded MbS. While KbF is super competent, the legally in place person MbS violently removed, Muhamed bin Nayef bin Abdulaziz al Sa'ud. In any case, recent Saudi policy has been an outrage, with its war in Yemen the extreme manifesation of how bad MbS is. The Senate has also voted against the US supporting this awful war, although not unanimously, and with the old House of Paul Ryan not supporting any of this. In any case, I applaud this unanimous vote for MbS to go. Really, the Saudi royal family needs to get its you know what together and overcome the current king's support fot his discredited son and put something more reasonable in as Crown Prince. There are several candidates available who would hopefully stop the horrendous war in Yemen. I have the deepest respect for Robert Shiller, who has been one of the most serious students of the dynamics of speculative bubbles there is, winning a well-deserved Nobel Prize for his work on this important topic. One of the more significant parts of his work has been on housing bubbles in particular, with his Case-Shiller indices being the most widely watched housing price measures in the US. Furthermore, in the second edition of his excellent Irrational Exuberance he laid out the case that housing prices from 19997-98 onwards into the early 2000s were almost certainly a massive bubble that would crash hard with dire consequences. He was right. So it is with some trepidation that I question his arguments in a recent New York Times column and in other outlets to the effect that we are again experiencing a speculative bubble in US housing markets (and it should be kept in mind that these are local so varied and not all behaving similarly). The centerpiece of his argument is that the average nominal house price in the US has now reaxhed and seems to be surpassing the peak level in 2006 before the crash that brought on the Great Recession. Needless to say, this is serious stuff that desrves a close look. Unfortunately these recent public statements by Shiller lack a crucial item that was crucial to the case he made in the second edition of his Irrational Exuberance that there was the biggest housing bubble in U/S history. That would be take account of the best measure of the fundamental, housing rents, or to translate that, to consider the path of the price/rent ratio. That he convinceed many people, including me, that housing prices in the early 2000s were a major bubble was that he showed that the average price/rent ratio had been rising in an unprecedented way, with it having been relatively stable theough most of the 20th century, including during the 1940s period that saw a major increase in housing prices. But that increase paralleled a rent increase thar indicated that indeed there was a major shortage of housing. The fundamental rent indicator triggered after a few years a supply repsonse that stabilized both rents and housing prices. In his NY Times column, Shiller claims that there have in the last century been now three great increases in housing prices, somehow without ever mentionging rents or incomes, a sometimes alternative to rents fairly strongly correlated with them. One was the 1940s runup, which seems not to have been a bubble because there was a genuine shortage of housing due to low construction during the Great Depression and WW II, with the returning vets from the war wanting housing. So both rents ans prices soared for several years until a new equilibrium was achieved, although Shiller somehow did not fill out those details in this recent column. Then there was the screaming bubble of 1997-2006, which he accurately called. Then he threw in the most recent price increase, emphasizing that it now matches and is beginning to exceed the 2006 peak, but somehow not having a word to say about rents. Frankly, I am mystified at this important lacuna. As it turns out, this recent price runup is sort of midway once one take into account what has happened to rents. For some reason Cas-Shiller does not track rents, but the Bureau of Labor Statistics (BLS) does. So if one puts these together using Jan. 1998 as the 100 base, then the national peak of the ratio occurred in late 2006 at about 1.87. It fell to about 1.2 at the price trough in 2012, and it is now at about 1.37. So clearly it has risen over the last six years, but that increase is about .25% while the curren level is still about twice that lower than the peak in 2006. Maybe this is a bubble, and certainly some local markets look like it. But this is still a long way from what we saw in 2006. So what is up? One thing that is up is that there clearly has been a lack of housing construction, given the steady increase in prices over rents since 2012 to a pretty high level. It is not clear why this has happened. It certainly cannot be blamed on high interest rates, even though those have been rising in the last few years. They still remain below historical averages in real terms. The obvious other culprit, emphasized by Ed Glaeser and others with good reason has been the mulifsrious restrictions on construction that are notoriously especially present in some of the hottest housing markets in the nation, such as LA and the Bay Area of California, as well as both New York and Boston. These certainly are worthy of condemnation, but it is not obvious that there has been any substantial increase in their severity in the last decade. This may be the case, but I have not yet seen anybody making that case at all. So it is not obvious looking at the usual suspects why we have failed to see US housing markets responding with a quantity supplied increase to this clear increase in both rents and prices. Rents have risen, but interest rates remain not too high, and supply has not been forthcoming. Having poked at the estimable Shiller, I recognoze that while he emitted a vibe of worrying about a housing bubble he held back from outright declaring that we are in one. I am sure he knows the data that I have pointed out here, even if he was not fully forthright about it in his recent columns and other public offerings. Not all is well in the US housing market. The price/rent ratio has been rising, showing some signe of incipient bubble behavior, if still not too wild in the vast majority of the US. But the failiure of housing supply to respond to the clear increase in rents, let alone the larger increase in housing prices, is something worrisome and to be concerned about. At the bottom end, rising rents drive rising homeleessness more than rising house prices, and we already have more homelessness than we should have. As most regular readers here know, I have long and old connections to the state of Wisconsin, having gone to high school, undergraduate and graduate school, as well as having family members there since then, with me visiting on a regular basis. When I first moved there back in 1963, the atate had the reputation not only as a Progressive stronghold, the home of "Fighting Bob" LaFollette as well as the location of Ripon, where in 1854 the Republican Party was founded in its days as the anti-slavery party of Abraham Lincoln (that first meeting had a non-trivial number of refugees from the failed German Revolution of 1848). On top of that, and at least as important, it had a reputation for clean government, super clean government. William Proxmire was a senator from there who refused to take campaign contributions and made his name exposing wasteful government programs with his "golden fleece" awards (actually that came after I arrived). I was a conservative/libertarian in those days, making me less proud of the progressive heritage, but I was proud of its clean government rep.
OTOH, there was also a dark side, which even my conservative father disliked, the fact that Proxmire was the successor to none other than Joe McCarthy, one of the worsst senators in US history. That was also part of the state's heritage, although many who voted for him thought that they were doing so as part of an effort to clean up corruption by an Eastern Establishment elite, just as many voting for Progressive "Fighting Bob" thought they were doing (and I am certain that there were people in the state who voted for both, with some of them probably also later voting for George McGovern, who was popular in Wisconsin, also out of an anti-Eastern Establishment motivation). In any case, Wisconsin has long had a deep political polarization, with this long being mostly within the Republican Party, with different parts of the state adhering to different traditions, with the reactionary McCarthy's base in the northeastern part of the state still the base for that dark side, even if awful outgoing Governor Scott Walker coming from the Milwaukee suburbs. Which brings us to the current situation following Walker's defeat by Tony Evers for the governorship after two terms, in which along with GOP control of both houses of the legislature as well as the state Supreme Court he undid substantial portions of the progressive heritage of the state on many fronts, with Walker openly denouncing that heritage and proud of his handiwork. Of course for some time he had dreams of taking all this to Wasington as president, but somebody named Donald Trump pushed him aside to get the job. And now Walker is on the way out. But now the state legislature is imitating what the GOP-dominated one in North Carolina attempted after a Dem replaced a GOP as governor, only to be mostly blocked by courts, to pass laws limiting the power of the incoming governor, with the also GOP-led Michigan legislature following along as well, if not with quite as extreme moves. In Wisconsin, although they did not move up the date for the election of a Supreme Court justice, they have passed legislation preventing Evers from making lots of appointments, allowing legislators to hire private attorneys to counter moves by the also Dem incoming Attorney General, such as to remove Wisconsin from the ongoing court case to upend the ACA, to restrict early voting, and to maintain control over the apparently corrupt state Economic Development council (so much for that clean government tradition). How bad things in Wisconsin are is that this legislature is massively gerrymandered and may be hard to get out of power. The sign of it is that while Dems won 53% of the legislative vote, the Dems won only 36% of the seats. These guys are clearly desperate and scrambling to hang onto power as long as they can in the face of the electorate turning against them. Two further points. One is that while Scott Walker apparently signaled his support for all this legislation, now six days since it was passed, he has not signed any of it. He has four more days to do so, and it is now clear he may be listening at least somewhat to those urging him to veto all or at least some od this mess. Why might he? He is clearly totally self-centered, so I think he is looking at his political future. Given that even some Republicans in the state are critiizing this legislative initiative, he may be trying to keep his options open for possible future office in the state. After all, he lost by a narrow maring in this just completed election. Signing this might well kill that. OTOH, he may be looking at going to Wasington, with it basically certain given the high rate of turnover going on in the Trump administration that something desirable might open up, although it also may become unpleasant if he cannot avoid annoying the prez. As it is, it is not obvious to me whether signing or vetoing or going partway between the two will help or hurt such prospects for him more. But I suspect that this concern is part of his consideration and delay in acting on this initiative. That what he does is as of now unclear, is why I put the ? in the title of this post. Anyway, we wait now with baited breath to see which on way Wisconsin will go with all this. Is the "Green New Deal" a Marxist Plot? At the CEPR blog, Beat the Press, Dean Baker and Jason Hickel are debating degrowth. Dean makes the excellent point that "claims about growth" from oil companies and politicians who oppose policies to restrict greenhouse gas emissions, "are just window dressing." I also agree, however, with the first comment in response to Dean's post that his point about window dressing could be taken much further. I would add that economic growth is window dressing for what used to be referred to much more aggressively as "man's triumph over nature" or the "control of nature." Climate change deniers are more forthright about this connection between aggression and so-called growth: "Is “Strive on -- the control of nature is won, not given” a controversial statement? What does it mean for science if it is?" asks Linnea Lueken at the Heartland Institute website. Scattered throughout his writings, Donald Winnicott made fleeting but intense criticisms of "sentimentality." "Sentimentality is useless for parents," he remarked in a 1949 article on the analysis of psychotic patients, "as it contains a denial of hate, and sentimentality in a mother is no good at all from the infant's point of view." The inference he drew from this observation was that "a psychotic patient in analysis cannot be expected to tolerate his hate of the analyst unless the analyst can hate him." It is partly false to state that we 'should provide opportunity for creative expression if we are to counter children’s destructive urges'. What is needed is an unsentimental attitude towards all productions, which means the appreciation not so much of talent as of the struggle behind all achievement, however small. For, apart from sensual love, no human manifestation of love is felt to be valuable that does not imply aggression acknowledged and harnessed. He might well have added, "And I'm not so sure about sensual love." But I digress. What does all this have to do with economic growth? Again, as Winnicott explained, "aggression that is not denied, and for which personal responsibility can be accepted, is available to give strength to the work of reparation and restitution." However, "[i]n sentimentality there is repressed or unconscious hate, and this repression is unhealthy. Sooner or later the hate turns up." Indeed, the hate does turn up at the Heartland Institute, where the "Green New Deal" is exposed as the "Old Socialist Despotism." If it fails to acknowledge the primitive aggression of "man's triumph over nature" that lies beneath the reparation of adopting environmentally-friendly policies, the debate between degrowth and green growth risks descending into sentimental bickering about the window dressing in the hotel on the edge of the abyss. I think this is behind the apparently bipartisan and intense outpouring of mourning over the death of 94 year old George H.W. Bush, indeed with some of this even being for the broader post-World War II era in which the US predominated over the world. Bush was president when the long Cold War with the former Soviet Union came to its end with the victory of the US and the breaking up of the USSR, as well as being the last president to have been a veteran of WW II, and a highly decorated one at that, leaving only Bob Dole as a major political figure still alive who is a veteran of that increasingly distant war that ended with the US clearly on top of the world economically and politically. While the Bush family has reportedly promised to avoid criticism of President Trump at later today's funeral, who will attend if not deliver a eulogy, iit is both the personal contrast between Bush and Trump that is propelling this high level of mourning, the general personal decency of Bush with the utter lack of any on the part of Trump, but Trump's role in apparently pushing forward the dissolution, or at least serious weakening of that order that Bush supposedly oversaw the beginning of at the end of the Cold War, a period when the US moved into a position of complete leadership with Francis Fukuyama even declaring that we had come to the "end of hisotry" as lwesttern-style iberal democracy seemed to sweep all before it. For all of his personal decency and moderation, as well as his generally capable and cautious handling of foreign affaris, Bush can be criticized for many things, mostly regarding domestic matters. He opposed the Civil Rights Act at the time it was being considered, although he later regretted that. His campaign ran the infamously racist Willie Horton ad when he ran for president in 1988. He ignored his own warnings about how Reagan's claim that he could cut taxes, increase defense epending, while reducing the budget deficit amounted to "voodoo economics," to join the Reagan admininistration as vice president and then promise "read my lips, no new taxes" while running in 1988. Of course he damaged himself politically by violating that promise in a budget deal in 1990 that involed raising taxes, with this preceding an economic downturn that led to his defeat by Bill Clinton in 1992. Nevertheless, despite these and other flaws, the contrast with the current incumbent, and on some matters with his own son, George W. Bush, GWH Bush looks on many matters like the epitome of wisdom and caution. He did not crow as the Berlin Wall fell and the Warsaw Pact broke up and the Soviet Union came to an end. Rather he negotiated a reasonable nuclear SALT treaty with Soviet llleadr Gorbachev as it wound down. He moved to support the entry of the nations coming out of the Soviet breakup into various international organizations. He quietly aided the reunification of Germany, which has turned out to be a peaceful power. He did not invade Iraq at the end of the first Gulf War. He afreed there is a problem with global warming and supported improvements in environmental legislation. He took a fairly even-handed position vis a vis Israel and the Palestinians and supported negotiations that would eventually lead to the Oslo Accord under Clinton. He supported negotiaions for expanding freer trade and the establishment of the World Trade Organizaion, again also completed under Clinton. He did not repeatedly lie or personally excoriate enemies or denouce the press as the "enemy of the people." Indeed, even as he climed not to be a "visionary" and merely competent and relliable (which he mostly was) he coined the term "New World Order" or at least advocated it, with this largely open and democratic order now apparently falling apart in a wave of nationalism and authoritarianism now spreading, with the apparent enciiuragement of our current president. This new turn arguably started with the ascension of Vladimir Putin in Russia at about the same time that Bush's son became president, although Putin's authoritarian tendencies only gradually showed themselves over time. But Trump's embarrssing and apparently corrupt fawning oveer Putin has highlighted the current state of affairs. China never stopped being nationalist or authoritatian, but power seems to be being centralized under President Xi even as China's position rises in the world, with it playing at being the defender of at parts of that New World Order as Trump so blatantly runs from it with such moves as his withdrawing of the US from the Paris Climate Accord as well as his trade protectionism policies as well as various international nuclear agreements from Iran to the INF with Russia. Even as Trump will now face some limits on his activities with the Dems taking control of the House of Representatives in the midterms, and he seemed imostly solated at eh G20 summit, in many countries authoritarian nationalists resembling or even openly imitating him are comintg to power or increasing their power, including in Hungary and Poland and Italy, as well as Turkey, Sauddi Arabia, India, and most recently and dramatically Brazil, where Bolsanaro promises to follow the US in withdrawing from the Paris Clinate Accord as he plans to ignore indigenous rights while engaging in massive deforestation in the Amazon rain forest. Several of Trump's strongest critics seem about to lose power or becoming serously weakened, including May, Merkel, and Macron. Supposedly he has achieved a truce with China on his trade war with them. But the sharp decline of the US stock market yesterday shows that many realize that this may be a meaningless flop along the lines of his nuclear agreement with North Korea and his trade war truce with the EU. In both of these latter two we were supposed to get negotiations, but none have occurred yet, and it is not clear any well. Mostly what we have seen is the lowering of tensions that Trump himself artificially escalated. This "deal" with China looks to be no different: the removal of a dangerous threat Trump made with a promise of future negotiations along with a promise that China will buy more US soybeans, which was probably goint to happen anyway. Even his replacement deal for NAFTA seems in danger of coming apart, despite it being officially signed by Trump and Trudeau and Pena-Nieto (the latter on his last day as Mexican president), as it now looks as though the incoming Congress is not keen on approving it. So the we see the widespread mourning for the late senior President Bush, as the world seems to be moving to being run by loudly nationalist and authoritarian leaders. Increasingly the danger seems not to just be trade war but war war. Let us hope that the worst of this will not come to pass, but that New World Order that the late President Bush supported seems to be passing for good, despite its various flaws and hypocricies, and there is probsably good reason to mourn its passing.